Ethiopia’s is facing emergency situation once again as its highest mountain chain, Semien Mountains which is one of the major tourist attractions in the country, is burning again. State Broadcaster, Ethiopian Broadcasting Corporation, cited North Gondar Zone Communication affairs coordinator to report that the fire broke out around 6 p.m local time. It started in Mitgogo locality. It is unclear if the Federal government has already responded to the emergency. Not even a fortnight ago, the mountain burned for five days before volunteers and local people managed to put it out. 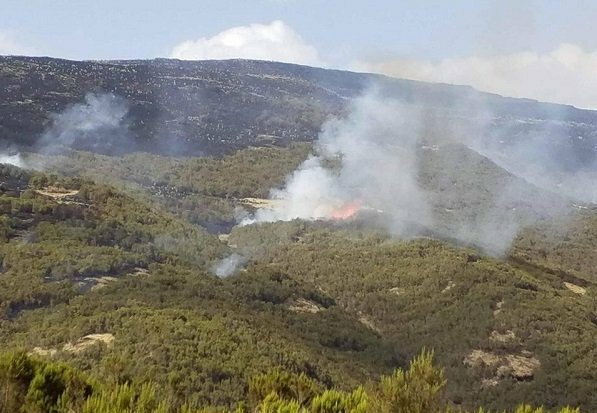 While the causes of the fire is not yet established, although the regional government promised to soon after the first fire, there are beliefs that the fire is an act of arson. 2 Responses to "Ethiopia facing emergency situation as Semien Mountains fire rages again"
Who else but woyanne is first suspect!